Game of Thrones Season 7 Spoilers: GoT 7 Plot Leaked or It’s Another Hoax? Game of Thrones Season 7 Spoilers: Let’s check if GoT 7 plot has been leaked or it’s one more hoax. The Game of Thrones, the name is enough to give us chills and fill us with excitement. This HBO hit TV series has already treasured a large number of viewers across the world and has gained more popularity over the years. July 16, 2017, is the day when we’ll have the premiere of the game of thrones s7. This time, the series have been reduced to 7 episodes. Fans across the world have put their breath on hold to see the GoT season 7 and are little annoyed when they get to know that the showrunner will wrap the installment in just 7 episodes. 1.1.1 1. The wall comes down! Redditor ‘awayforthelads’ started a chain about season 7 leaks and posted the synopsis of each episode which even caught the attention of producers and some cast members who tweeted about it. But there was no confirmation whether the leaks even resembles the storyline or not. 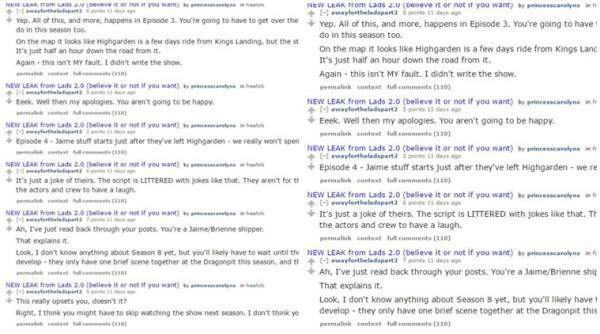 After this, the redditor deleted the account and thing got normal for some time then there came a new redditor account named ‘awayforthelads2’ who took the charge of posting leaks and they took it some further after posting 6 pages of script claiming it to be of season 7 in January 2017. Check: Arrow Season 5 Episode 19. 1. The wall comes down! Yes, you heard it, right guys. The wall may come down. We watched the Facebook live video of GoT7 when they announced the premiere date of season 7. The leak thread which was given by radditor long before fan had any idea about teaser or trailer and they got it right. How would have they guessed it? The Khaleesi aka mother of dragons and the Lord of the North will work together to end the white walkers. There are chances of it happening towards the end of the season and if sources were to be believed Jon Snow promised to give up his title. Stark family will be together again. After leaving Braavos as “No one” it is expected from Arya to come Winterfell back. It would be interesting to see if she murders Lord Baelish on the orders of her sister Sansa Stark. According to the threads, Cersei told Jamie about her lying “to promise Jon Snow for help when he brings the head of a white walker in dragon pit to realize other players that there are bigger threats than they are facing now.” The action of her filled Jamie with the disgust feeling and thus, he left her and rode to the North. None of the major Game of Thrones Season 7 Spoilers (GoT 7) has any idea about who’ll get the iron throne. The producers may go with the Lannisters to prove everyone’s predictions wrong, or it could be Starks too. But it would become interesting when we see Danaerys and Jon Snow together on the iron throne. Kim Harrington (JonSnow) revealed that his character would be going to a dark place so we guess it might be the iron throne. Keep visiting our site for every update.